As I wade into Advent, the days of waiting, expectation and longing, I think about Mary, the mother of Jesus. 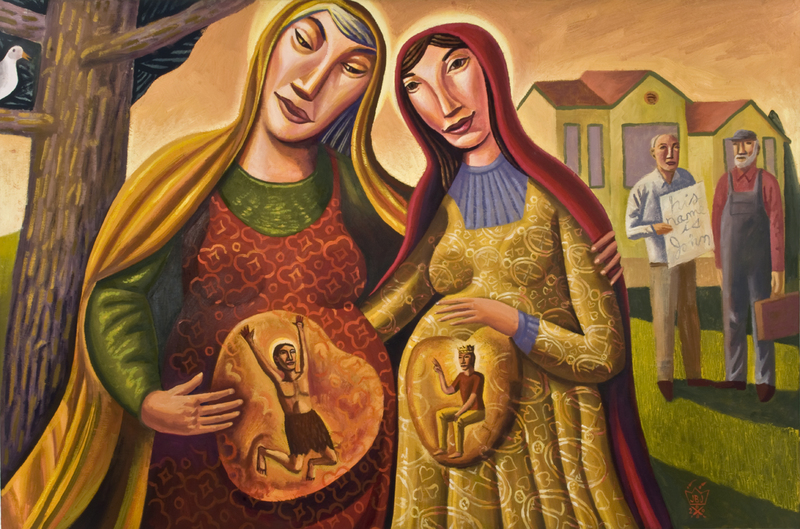 I have been reflecting on Mary’s reaction to Gabriel’s announcement about the conception of her son (some of which comes from The Real Mary by Scot McKnight). There are two incredible things that Mary accepts in that account. She is given an incredible message that as a Hebrew woman certainly means shame and ridicule. Yet she says, “Let it be according to your word.” Then she turns to her cousin Elizabeth and launches into one of the greatest protest chants of the Bible, which is often called the Magnificat. Here is what Mary accepts. Mary accepts that nothing has to change for her to be involved in God’s plan except for God to get in the mix. She didn’t have to earn a Masters in Social Work or Economics to analyze the problems in her society and come up with a solution. She didn’t work her way into the places of power in order to affect change. She remained a humble, common person brought even lower by God’s means of reaching out to us. Being part of God’s plan didn’t make her life better. It made it worse. She also didn’t need to be special. She only needed to be faithful and that is what the phrase “Let it be according to your word” shows, her faithfulness and trust in something so outrageous and difficult, yet true and good. So, Mary accepts her own reality. She takes life and the world as it is and doesn’t expect it to magically change. She will suffer because of God’s plan. Yet she is also able to proclaim something totally unbelievable. She proclaims the Great Reversal in which God turns the world upside down and reverses the unjust ordering of the world. She didn’t pull this out of thin air. She would have heard the words of the prophets proclaiming just this. The incredible thing is that she accepts that this is the way things will be and that this is what God is doing in the world. It’s not abstract and it’s not future tense. This is what is happening. How hard it is to accept both things, that my life is ordinary and that suffering and pain are part of life and that will not change no matter how much I pray or love God, AND that God involves me in God’s work of redemption and reconciliation in this world just as I am (without one plea). Perhaps it is my privilege that makes this so difficult, but that is a post in itself. As I yearn and long for God to make things right, for life to have balance, meaning, purpose and fullness, may I also recognize that God is already here. Nothing has to change for God to show up, and just because nothing changes doesn’t mean God is absent. We proclaim a reality and truth that has already arrived and changed everything, yet life continues and remains ordinary and mundane. May we follow Mary’s example and proclaim “Let it be according to your word” somehow living between these two realities.